Alphonsus Liguori also testified in the 16th century of seeing this blood and the miracle that took place annually on his feast day: "At Ravello, a city in the kingdom of Naples, there is a vial of his blood, which becomes blood every year, and may be seen in this state interspersed with the milk, as I, the author of this work, have seen it." The flask that contains the blood is artistic, flat on top with a narrow neck, and is quite old as can be seen by its primitive composition. The crack in the glass on the left side of the flask was caused in 1759 by a priest who held a candle too close while he was examining the condition of the contents. Fearing that the blood would seep through, the priest made a hasty vow that if no blood escaped he would have a statue made of the Saint. This he did as documented by the inscription on the plaque attached to it. In 1781 the ecclesiastical authorities decided to purchase a new crystal, but circumstances never permitted it. It was assumed, therefore, that the will of God, as well as that of the Saint, meant for the blood to remain in the plain cracked flask that is the original container. In this container the blood is clearly divided into four strata. The lowest level seems to be of sand or dirt mixed with blood since it is dense and dark. The second strata which is as deep as the width of a finger appears to be composed of dirt, but with a greater amount of blood. The third strata is pure blood of a ruby color when melted and this strata is below the highest level which consists of whitish foam. The blood only occupies half the container when the blood is inactive. In the empty portions traces of fat and blood can be seen adhering to the glass. When the liquefaction takes place, the strata of pure blood turns transparent and ruby colored like fresh blood, while little bubbles reach almost to the top of the container. On the upper part of the glass flask there is a large spot of dark blood that turns wet and reddish at the time of the miraculous liquefaction. It is important to note that the flask cannot in any way be touched or turned or shaken. It is absolutely untouchable since it is held firmly between the two iron clasps of its reliquary and is secure in its position. The feast day is July 27. The blood may liquefy on that day, but sometimes does not. It may gradually begin to liquefy at the beginning or middle of July, and may continue for a month or longer, sometimes for only a week or a few days. This unusual aspect of the miracle has been documented since 1577. The blood is not coagulated or hard as would be normal. It is not dried or corrupted, but has been kept in a perfect state of viscousness, in an almost fluid state. It is indeed extraordinary that this sample of the martyr's blood has remained in this condition for over eighteen centuries. John Henry Newman also adds: "But the most strange phenomenon is what happens at Ravello, a village or town above Amalfi. There is the blood of St. Pantaleon... There is an excommunication against those who bring portions of the True Cross into the church. Why? Because the blood liquefies, whenever it is brought. A person I know, not knowing the prohibition, brought in a portion - and the priest suddenly said, who showed the blood, 'Who has got the Holy Cross about him?'" 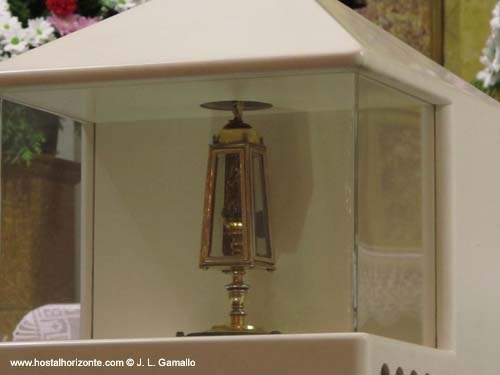 A phial containing the blood of the physician and martyr Saint Panteleimon is preserved from time immemorial in a left-side chapel of the Cathedral of Ravello. Above the altar of the relic is a 1638 oil-on-canvas by Girolamo Imperiali depicting the torture of Panteleimon. Portions of this blood have been distributed, such as to the Monastery of the Incarnation in Madrid of Spain, where this miracle is repeated as is done in Ravello. It is also done in the Italian cities of Naples, Bari, Vallicella, Lucca and Venice.